Once a historic legislative win in 1976, Black History Month today allows people who would prefer not to discuss race to know what time of year they will be expected to, prompting those people to stay away from compassionate liberals and black people. Black History Month has become the metaphorical kitchen light switch that causes everyone disinterested in race-based discourse to scatter. But this year, on February 1st, Harper Collins released a book powerful enough to stop even the basest thinker in his or her tracks. Baratunde Thurston’s How to Be Black provides a refreshing look into the black experience, using a satirical approach that disarms as much as it educates. 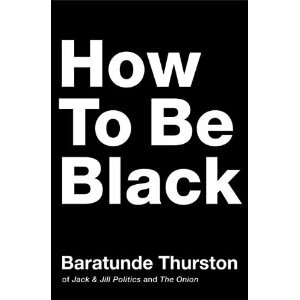 A worthwhile read for people of any race, How to Be Black not only uses Thurston’s personal experience for a lens into the black American experience, but it also provides varied notions of blackness from a select panel of thought leaders in art and comedy. These other viewpoints add depth to a text that may have otherwise been unjustly dismissed as one man’s opinion. Instead, Thurston allows his panel, which includes comedian W. Kamau Bell and Christian Lander (Stuff White People Like), to add real-world subtext to the how-to scenarios that seamlessly jump from spot-on to absurd with little to no warning. Thurston’s comically outlandish depictions of black life (i.e. in academia and the workplace) pale in comparison to the true experiences shared by the panelists, who have clearly risen above racism in their lives, but still have made racial discourse a priority. In recent decades, black people have struggled to identify voices that echo how their experiences differ from societal perception. Unfortunately, the mainstream commoditization of blackness in music, film, and sports has created a greater challenge than the Jim Crow South ever did. But Thurston and his panel rage against the illusion of defined blackness by demonstrating how fluid the definition of blackness has been and will continue to be. The unfortunate perception of Black History Month stems, in part, from its marginalization of an entire people’s background to 28—or in this year’s case 29—days. And, as expressed by Thurston and his panel, American education defines black history as more buzzkill than triumph. While black intellectuals concern themselves with positive assertions of blackness throughout the year, white America lets itself off the hook, as if time window facilitates the education about the myriad frustrations that black people have endured. In fact, an argument could just as easily be made that the concession is, in itself, counterproductive to all Americans. Previous: Kim Jong-un to Hip-Hop Fans: You Betta Lecognize!